Frankie Bailey does not work for, consult, own shares in or receive funding from any company or organization that would benefit from this article, and has disclosed no relevant affiliations beyond their academic appointment. During January’s Sundance Film Festival, ESPN premiered a 7.5-hour documentary titled “O.J. : Made in America.” The network is scheduled to televise a version of the documentary in five installments in June. This comes on the heels of FX’s original miniseries, “The People v. O.J. Simpson: American Crime Story,” a dramatization of the O.J. Simpson case. Because anniversaries are occasions for retrospectives, the 20th anniversary of the O.J. Simpson case wasn’t likely to pass unnoticed. However, two decades of media research now allow for a more complex analysis of one of the most iconic trials in American history. On the evening of June 12, 1994, Nicole Brown Simpson and her friend, Ronald Lyle Goldman, were slashed to death outside Nicole Simpson’s upscale condo in Los Angeles, California. Simpson’s ex-husband, O.J. Simpson, a former pro football player turned sports commentator, actor and pitchman, was charged with the murders. With a captivated nation glued to their TVs, radios and newspapers, media outlets rolled out a “cottage industry” of trial experts to offer daily commentary. It was through this media lens that the majority of Americans learned about the intricacies of the case – and made their own judgments about its outcome. Post-trial research has found that audience perceptions of guilt or innocence were shaped by the amount – and type – of media consumed. Scholars today also realize that the media, when constructing narratives about crime and justice, will often fall back on popular themes and cultural stereotypes. Shaped and reinforced by the media, these constructs influence how victims and offenders are perceived. For example, one study showed how newspaper coverage tended to depersonalize female victims of violent crime. This is not a new phenomenon: real-life crimes always have inspired true crime narratives and fictional accounts. But since the late 20th century, this has occurred more quickly, with greater frequency – often before a trial has even ended. According to criminologist Gregg Barak, the O.J. Simpson case was a true “spectacle” – essentially a nine-month live news broadcast. At the same time, because of Simpson’s celebrity, the case was being consumed as popular culture. Meanwhile, reactions to the verdict largely fell along racial lines. Throngs of white Americans responded with shock, dismay – even anger – while crowds of black Americans responded with elation. The public reacts to the O.J. Simpson verdict. Polls and surveys later found people’s reactions to the verdict reflected not only their opinion about O.J. Simpson’s guilt or innocence, but also their beliefs about race and the fairness of the country’s criminal justice system. A historical analysis of the links between a late 19th-century murder case involving a white, upper-class woman and the O.J. Simpson trial – with each accused of double murders – offers an opportunity to explore the intersections of race, class and gender in popular crime narratives. In August 1892, Andrew Borden, a wealthy businessman, and Abby, his second wife, were hacked to death in their home in Fall River, Massachusetts. Accused of killing her father and hated stepmother, their 32-year-old daughter Lizzie Borden was the subject of exhaustive media coverage. A century before O.J. Simpson hired what the media called a legal “dream team,” Borden had a star-studded defense team that included a former governor and the Borden family lawyer. Like the Simpson case, the legal strategies of the prosecutor and the Borden defense team were subjected to much media scrutiny. Most of the evidence against Lizzie Borden was circumstantial; in the end, Borden was acquitted by an all-male jury that may have found it difficult to believe a respectable spinster could commit such a horrific crime. Yet Lizzie Borden was never able to escape the stigma of having been accused of murder. Upon being set free, she found herself ostracized by former friends. For years, newspaper coverage documented Borden’s life after her acquittal. Since her death, the countless books, articles, a made-for-TV movie – even a recent TV series about Borden’s life after the trial – demonstrate the staying power of the high-profile, 19th-century trial. Like Borden, Simpson was able to use his class and wealth to his advantage. But he was also excoriated during – and after – his trial. By the 1990s, Simpson seemed to have done just that. A middle-aged O.J. had achieved celebrity status, and he appeared to have transcended this blackness by distancing himself from poor and working class blacks, while gaining the acceptance of whites who saw him as a celebrity immune to the trappings of racial stereotypes. Despite some incidents of domestic violence, Simpson had been able to maintain this genial reputation – until he was accused of the murder of his white ex-wife and her friend. The horrific nature of the crimes made it unlikely that he would survive with his reputation untarnished. However, with the accusation race became a factor. 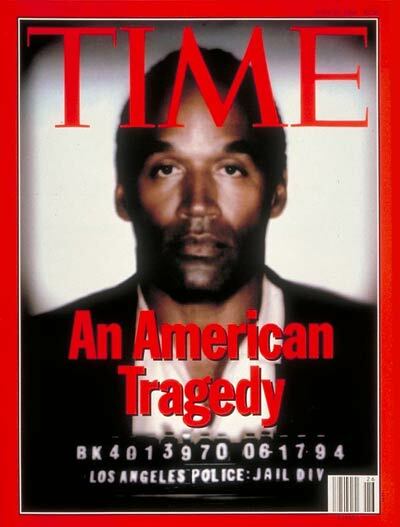 Simpson’s fall from grace was symbolized by a controversial 1994 Time magazine cover photo, which some claim darkened Simpson’s face to make him appear more black. In the 20 years since the Simpson trial, the gap between how blacks and whites on Simpson’s verdict has narrowed: Blacks are now more likely than before to believe that Simpson was guilty. However, Simpson’s fragile public image was a reminder of the limits of his ability to transcend race. And with the events of Ferguson, Baltimore and other cities and related protests, there’s no indication that African Americans have more confidence in their criminal justice system.